Instagram Stories have been one of those really cool features to watch…. When they came out, they ruffled a lot of feathers. Not just with Snapchat, but regular Instagram users too. Collective sighs of “NOW I HAVE TO POST IN TWO PLACES! ?” (a sigh can be a SCREAM, okay?) echoed throughout many people’s posts. And I’ll admit – when they first came out, I was not an early adopter by any means. I wasn’t comfortable showing my face, hearing my voice, knowing what to say, and going live?? …forget about it! Luckily, I turned a corner and started to fall in L-O-V-E with Instagram Stories and what they can do for your business. Their easiest + best benefit? They cut down on the amount of time it may take to turn a new follower into a customer. Because when someone can see and hear YOU, it builds that ‘know, like, and trust’ factor faster than any collection of beautiful pictures can. And gives more context behind the heartfelt, silly, or funny captions you write to allow people to *really* get to know you and your brand. If you’ve been around here awhile, you know I’m still not super comfortable with video. BUT the first time I did a big video training in the Maker’s Biz Summit, I had so.many.people reach out and connect with me. Since then (and through a lot of “you’re being an idiot Kate, just freaking post it” self motivation), I started to find my stride in posting Stories and actually creating content there that supports my business. Pause to re-read….. SUPPORTS … BUSINESS. While I still post a lot of personal moments or random thoughts (mostly dog related let’s be honest); I also found my sweet spot in how to use Instagram Stories to move the needle and matter for my business goals. So today I wanted to share 3 shifts I see happening on Instagram because of Stories. This post contains affiliate links; which means I may (at no additional cost to you) earn a commission if you purchase through my links. I only recommend what I love + use; and appreciate your support of The Shop Files! Stories create the feeling that we’re almost chatting 1 on 1. With the ability to directly reply to a video or photo you share *as if it’s a direct conversation*… (ahem, dm’s) it naturally encourages people to chat back. Most of my time spent on Instagram chatting now is through direct messages with others (although I still also like to comment on photos in the feed); but I’ve seen a MUCH HIGHER response rate through Stories. I’m talking brands with thousands upon thousands of followers replying to my DM. When I almost never got a reply from comments. QUICK TIP: Use this to your advantage to further the relationship with potential customers. Answer all your DMs. Do so in an open ended way that encourages more conversation, instead of shutting it of. Use the polls, questions, and gifs feature to ASK for that engagement. *bonus – the Instagram algorithm takes Stories engagement into account. So if someone is replying to your questions/polls/DMs etc, that’s a GOOD thing for your overall Instagram goals too. Instagram Stories have created this “ever present” feeling. I have gone months, literally months, without posting to my feed and when I came back, no one said a thing. In fact a few people actually asked how I “always stay so active on Instagram” and I had to laugh and kindly point out my lack of feed images. I used Instagram Stories consistently to give that sense of “always being present”. They’re much faster + easier to create than that “perfect photo” to fit your theme. AND they give a deeper sense of “being present” because I’m talking directly to them on camera or showing pieces of my life and business. QUICK TIP: How can you develop a rhythm of what to say on Stories to support your business? ie. still gives your customers that value/education/inspiration they come to Instagram for. With everyone now creating more videos or short-form content than ever before, I’ve seen this balance between creating well-crafted edited videos and keeping that “Instagram” feel. I’ve seen this lately where big brands are doing sponsored Stories…. In the past, the video would be what I’d call “high production”. Lots of editing, transitions, perfect brand elements, etc. But now, their sponsored Stories are totally seamless. They blend right into the Instagram look by using basic Instagram fonts, iphone editing app capabilities, and sticking within that “carefully thought out, but not scripted” balance. QUICK TIP: Get familiar with a few specialty editing apps (or even just all the Instagram features) and pick a couple to use consistently. There’s a ton of video/photo apps to use to elevate your game and keep your Stories content “on brand”; while at the same time keeping that casual feeling of not being *too* overly scripted. What changes have you seen on Instagram because of Stories? As you guys know, video and photography are something I’m still personally working on, so I wanted to share a resource I found incredibly helpful. Alex Beadon is basically the QUEEN of Instagram Stories. Over 300 million people watch Instagram Stories each day. 300. MILLION. And if those people are anything like me, they get sucked in for awhile. Twenty minutes can easily pass before I even blink to consider how long I’ve been watching Instagram Stories. Which is why I knew I needed to step up my own game. Alex’s energy is next levellll and she’s been doing video for years (and built an impressive YouTube following with those skills). Of everyone I followed on Instagram, her Instagram Stories always stood out. 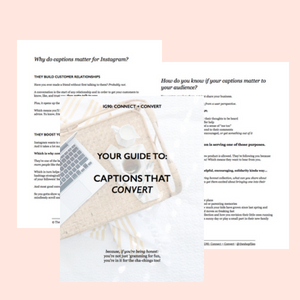 If you’ve been looking for a way to take your Stories up a notch and support your business in a bigger way, I wholeheartedly recommend it because I trust her and the results I’ve seen since taking her course GramSlam. What questions do you have about Instagram Stories?